A Prince Edward County native has been recognized for his efforts by an international franchise chain. 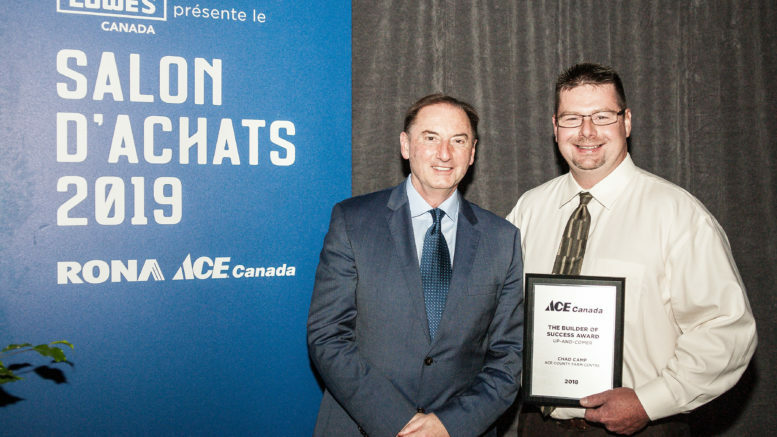 As part of annual gala held during the RONA and Ace Canada Buying Show presented by Lowe’s Canada in Montréal earlier this month, Ace County Farm Centre manager Chad Camp has been chosen as the 2018 Up and Comer Award from the Ace Builder of Success Program. Camp accepted the award in front of more than 1,750 people gathered to honour RONA and Ace affiliate dealers. A new award category, the Builder of Success program was introduced this year to recognize affiliate dealers and their entrepreneurial spirit, community involvement, and success in ensuring the long-term viability of their business. Ace Canada and the County Farm Centre joined forces in February. The 7,000 sq. Ft store, located on the western outskirts of Picton, is open Monday to Saturday. “I’m honoured to receive this award from Ace. It is a result of dedication and a team of hard working individuals pulling together and believing in each other. I would like to share this award with my team and thank them for all that has been achieved over the years,” said Camp.